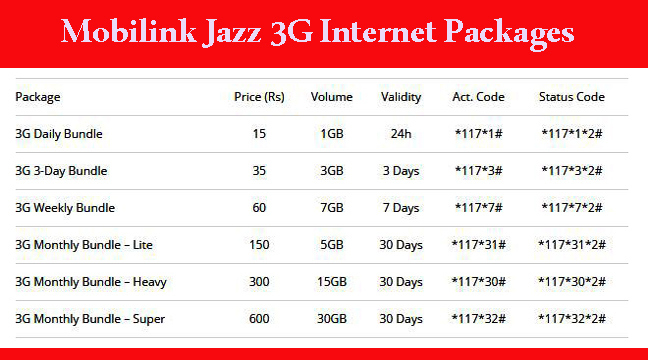 Jazz All 3G Internet Packages From Daily, Weekly to Monthly. Jazz internet package. Jazz 3g internet package 2017. Mobilink has the record for being one of the largest cellular services in Pakistan. After achieving the astonishing results in call and SMS packages lines, Mobilink is also offering its 3G internet packages to its customers to enjoy the best internet surfing and downloading speed at best affordable rates.Most of the internet users in Pakistan like to use internet packages for using Facebook, WhatsApp and other social platforms that’s why Mobilink has crafted its daily, weekly and monthly plan in such a way that these people can get for what they are looking for.